I hope you are enjoying your Sunday wherever this blog entry finds you. This is the final Sunday blog of BMT. 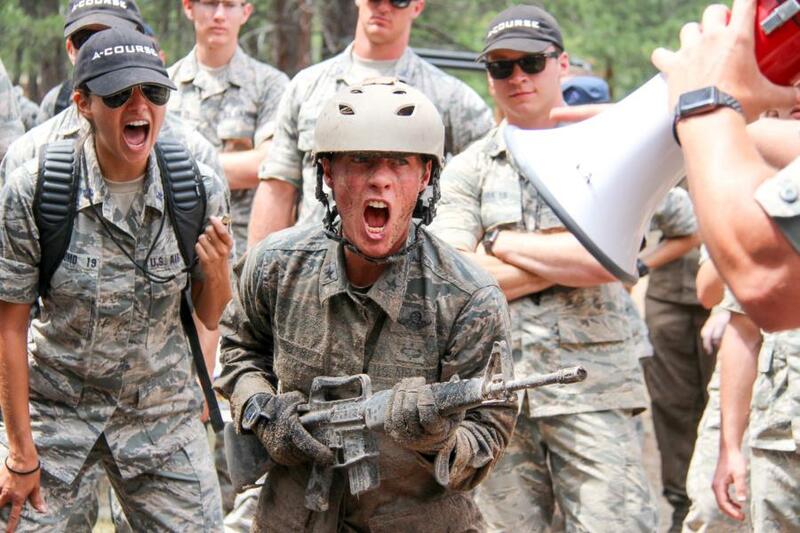 By this time next week, your basics should be officially USAFA Cadet Candidates. They will likely have a down day in preparation for beginning the academic year. As we get further into the coming week, I will talk about what that will look like for them and also what our academic year WebGuy coverage will look like. But, I am getting ahead of myself. Looking at today's training schedule, there are chapel services for those who wish to attend, and personal time for those who don't. Later, the squadrons are practicing for the parade as they did yesterday. The big training event is the official SAMI. Yesterday was a practice one. We are going to try and get some photos, but I want to manage your expectations on that. Since the inspections are going on simultaneously in all 3 dorms, and I am the only photographer today... Well, you get the idea. I will get a representative sample to give you the idea. Next order of business today is to clear up some confusion from my FB post yesterday. See the photo below. I posted this photo as a teaser on FB with a promise of the explanation here in the blog yesterday. Apparently, I didn't fully explain. Here is what is going on. Again, this is a flight of basics from Charlie Squadron. They are doing a knowledge competition. 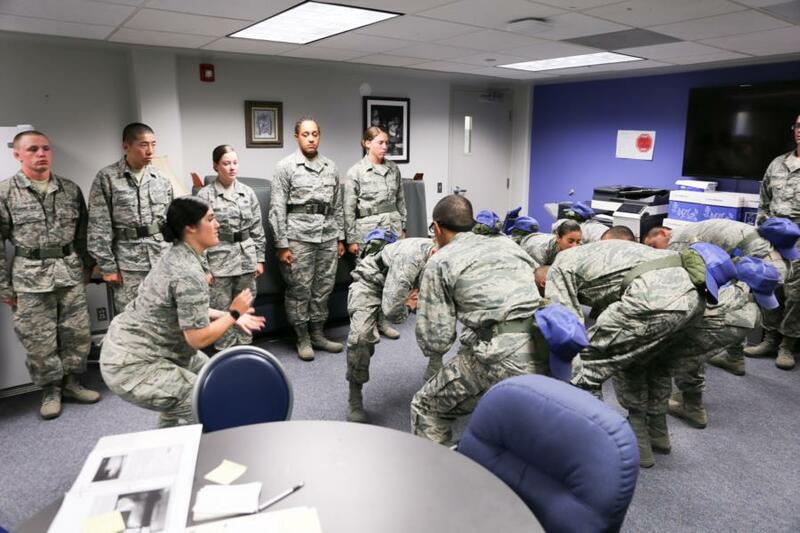 The group in the squatting position in the middle of the room are answering questions posed by the cadre member with her back to you in the photo. You know the photos you have seen with the basics holding the little book up in front of their faces when standing in line? Well, they are supposed to be memorizing the information in that book. In this photo, the "squatters" have to stay in that position until all the questions in that round are answered correctly. Each flight came in to compete in turn. Not sure which flight this is. Like everything else done in BMT, this is not just exercise for the purpose of exercise. 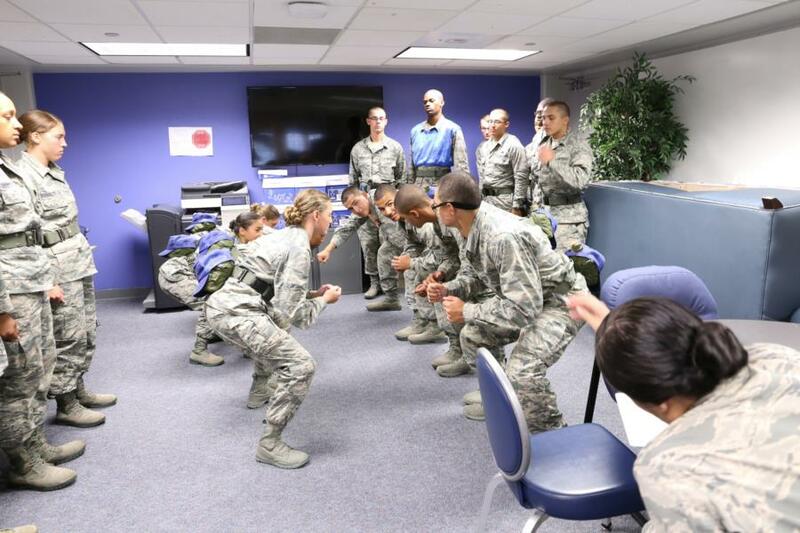 It is a team building exercise, and like everything else in BMT it teaches thinking and reacting calmly under stress. This is a necessary skill in the military. Later, the cadre member will join the squatters in that position in order to lead by example. The cadre never make the basic do something they are not also willing to do themselves. It is amazing how quickly they can recall that knowlege in order to get out of that squat. On a related note. 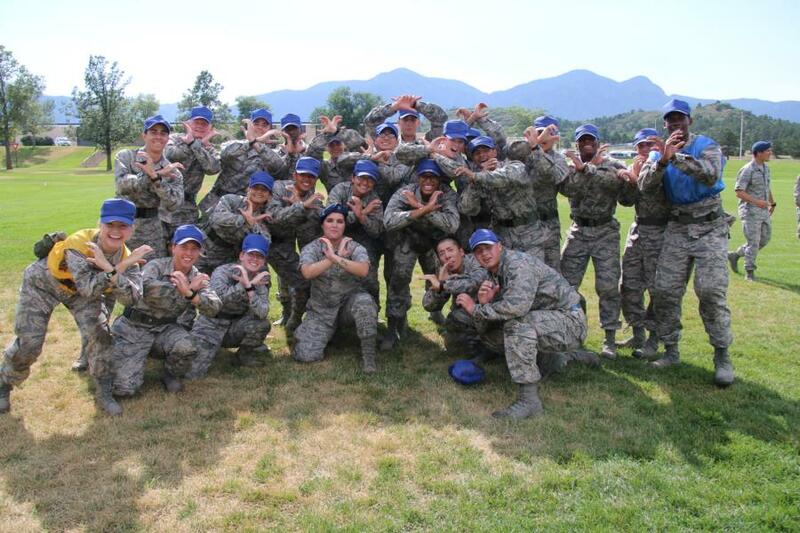 Below is a photo taken yesterday during Basic Cadet Training in Jacks Valley for the USAFA Class of 2022. That is USAFA Commandant of Cadets, Brigadier General Kristin Goodwin, going through the Assault Course along with her basics. She also leads by example. 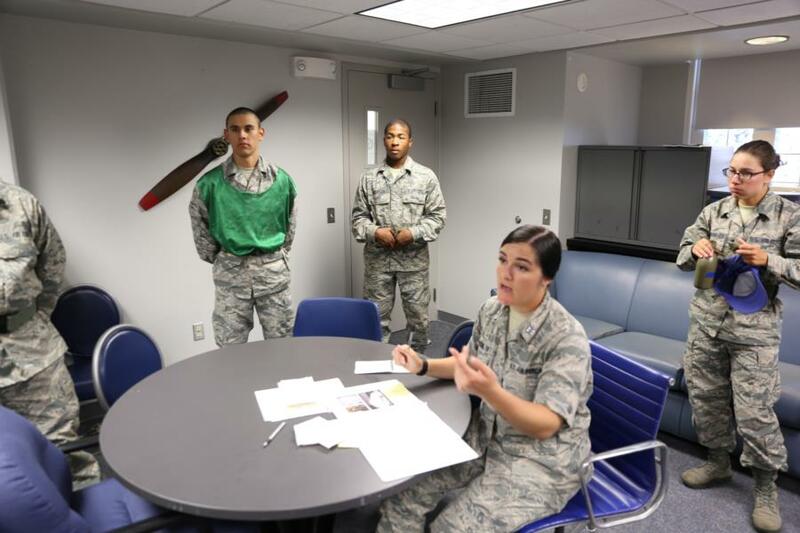 I should tell you Alpha and Bravo families that we are not ignoring your squadrons. They all do the same types of team building activities. We get them all eventually. Congrats to the overall winners of this team building competition relay race. Ok. That's it for this entry. The team building photos are up in the BMT gallery. NEW PHOTOS. Be sure to sort newst to oldest to see the most recent. I'll be back with a Sunday wrap-up later this evening.